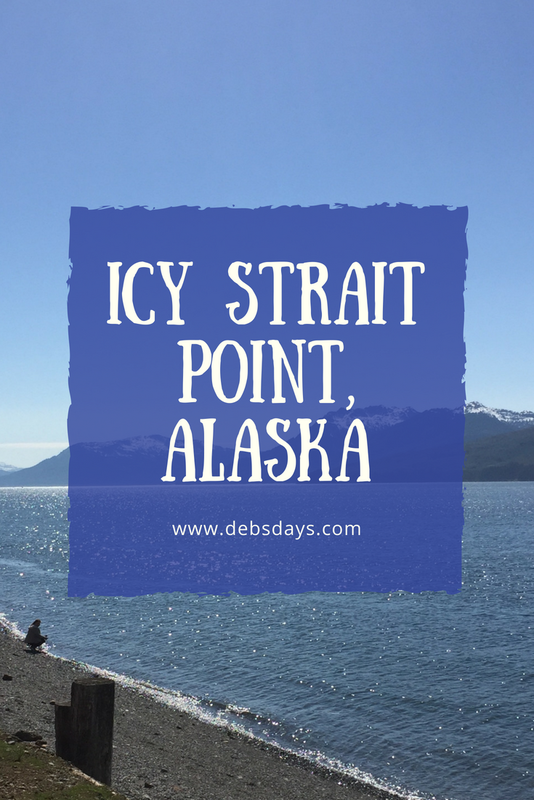 This week is our 14th cruise to Alaska and it’s the first time we’ve had Icy Strait Point as a port. We originally booked a wildlife tram excursion, but after reading the detail onboard we decided to cancel. 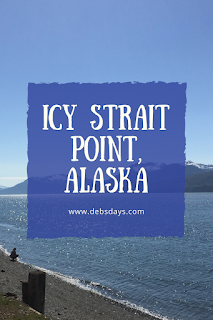 The description stated there was a walk over uneven terrain and with hubby’s limited mobility we couldn’t risk it. We have to take great care with him when we travel. We bring our handicap placard with us everywhere when driving, we go places where we can avoid stairs and only use handicapped ramps, and can only walk places that have spots to sit all along the way. It’s rare for him to leave the ship unless we’ve scoped things out ahead of time. After canceling our excursion we didn’t do any planning and we never received a port guide so we just had to wing it. While there is a bit of a walk to get to land, there was a little shuttle for folks with disabilities. Thankfully it was a spectacularly beautiful day. We waited forever to get on the handicapped shuttle and even had to wait for a second one to come around some 15 or so minutes later as some passengers seemed to think they were more disabled than others and pushed to the front of the line. Listening to the conversation of those cutting the line was quite, well, interesting. Someone was legally blind. Someone just conquered cancer. Someone had spinal surgery. My hubby, who has cerebral palsy, just rolled his eyes at me each time one of the folks tried to one-up each other. And wouldn’t you know it, when the shuttle showed up every single one of those people made a mad dash for it. Some appeared even spritely at that moment. They were so pushy and hubby has to move so slowly I almost thought we would have to wait for a third shuttle. The shuttle dropped at a couple different points along the way and we chose the stop where the shopping was. We’re not shoppers but there was a beach that had some benches along it. It was so warm I think we might have even gotten ourselves sunburned. We saw some whales, watched some local kids playing in the water, and did some people watching. I made a stop in the Icy Strait Museum which was basically a bunch of stores with a museum at the end. After the mess of catching the handicapped shuttle we opted to just walk back to the ship. We walked the upper level of the beach area where there were lots of benches and logs to sit on along the way. We even stopped at a campfire for a bit, which was probably good because as soon as we rounded the end of the beach we ran into some biting wind for the rest of the walk back. Brrr and double brrr. There was also a shuttle that took passengers into the village itself for $5 but we opted to skip it as we had already walked a couple miles and hubby was done for the day. If we visit again, I’ll take the village shuttle on my own so I can explore a little farther out than the cruise ship area. All aboard isn’t until 9:30 pm tonight and we have an 8:00 am arrival in Juneau in the morning. Looks like we’ll have good weather for one more day so we’re hoping to make it to Nugget Falls if hubby is up for it. So no big plans for the evening, just some rest and some conversation with our Crooners guy. Let's not forget a Violetta martini. *An evening note - the lady at the handicapped shuttle who cut the line, the one in the wheelchair who complained to everyone that she's had to use it everywhere she went on this trip, just ran past me, carrying a cane (no wheelchair in sight), trying to follow a bald eagle that was flying towards the front of the ship. Can't wait to tell my eye-rolling husband. Today's Patters can be found HERE.